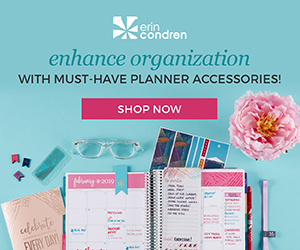 This page contains affiliate links, which means I can earn a small commission if you make a purchase after clicking them. This post is not sponsored. The product being reviewed was purchased with my own money. Anyone who’s been around these parts for a while knows that when it comes to beauty products, I appreciate having a healthy mix of high-end and drugstore options. Sometimes the quality of a product merits the extra cash, sometimes the budget friendly option performs better. It’s one of the things I love about beauty blogging. The more I try and review, the better able I am to compare and contrast so you guys can reap the benefits! 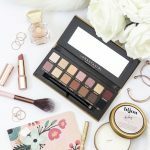 I know I’m not the only one who loves searching for a good dupe. It looks like my original Save or Splurge post has been getting a lot of attention lately, which made me think it’s about time I did a follow up! Over the past 7 or 8 months I’ve been keeping an eye out for potential pairings, and I think I’ve now rounded up a nice little selection of products to share with you guys. 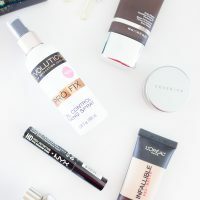 Today I’ve got four of my favorite high-end beauty products to talk about: a cult favorite liquid lipstick, an iconic brow pencil, the perfect summer blush tint, and the super glue of eyeshadow primers. Are they worth the splurge? Or should you save your money and opt for these budget friendly drugstore options instead? Let’s take a look! If I didn’t already have 100 lip products sitting in my bedroom, I’d probably want to own another five shades of the Too Faced Melted Liquified Long Wear Lipstick. 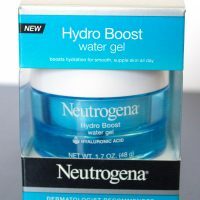 It’s got one of my absolute favorite formulas, has a really unique applicator, and smells BOMB. 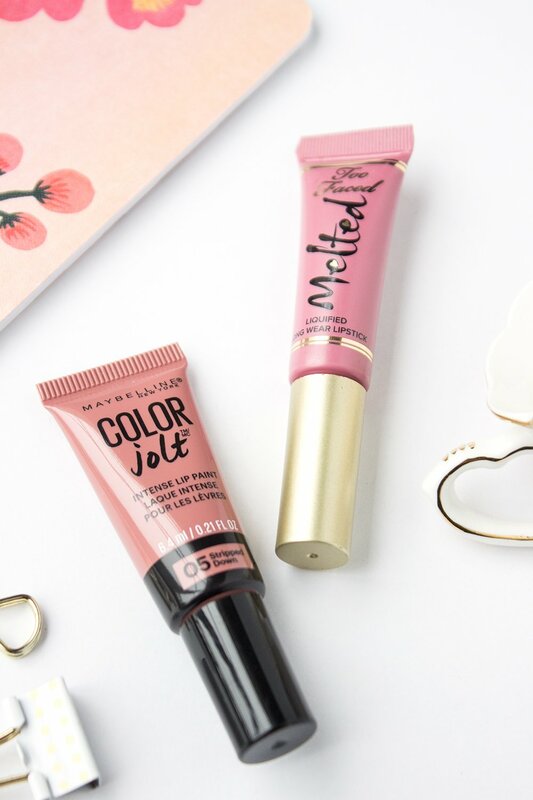 So of course, when I saw the Maybelline Color Jolt Intense Lip Paint enter the scene with a very similar packaging and feel to Too Faced’s, I was immediately intrigued. I picked up the shade 05 Stripped Down, which seemed most similar to the TF shade Chihuahua that I already owned. So let’s start out by comparing the most obvious of similarities between these two lippies: the packaging. One of the trademarks of the TF Melted Lipsticks is its squeeze tube and slanted velvet tipped applicator. I find that it offers a fair amount of precision with application, and gives you a lot of control with exactly how much product you’re putting on your lips. While a lot of other lip products have a slanted tip like this one, I think the velvet actually does help to distribute product more evenly (plus it feels nice too). Maybelline is the first drugstore brand I’ve seen that’s replicated this unique applicator, which made it an obvious choice for comparison. Now, the picture above is actually somewhat misleading, because I don’t actually own Melted Chihuahua in the full size (pictured is a deluxe sample). So while it may appear that the Color Jolts are similar in size to the Too Faced Melted Lipsticks, they’re actually more like half the size. A full-sized TF Melted Liquid Lipstick has 0.4 oz of product for $21, while a full-sized Color Jolt only has 0.21 oz of product for $10. So when you do the price-per-ounce comparison, they’re actually almost the exact same value. 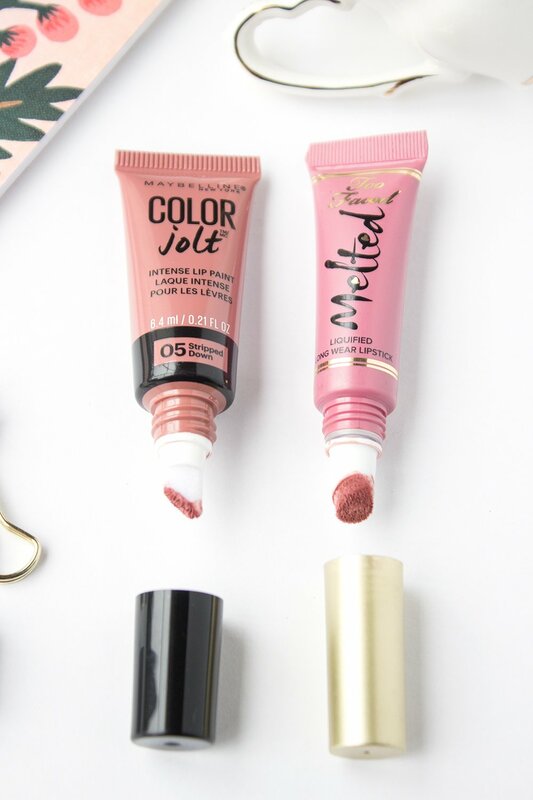 When compared side-by-side with the full sized TF Melted Liquid Lipstick, the Color Jolts are much smaller overall, and also have a proportionately small applicator. On one hand this does give you a little more precision, but it also means that it takes longer to apply your lipstick. So what about the formula? In the picture above I’ve swatched these two lipsticks side-by-side. On top is the Too Faced, on the bottom is Maybelline. As you can see, the shades of these two lipsticks are near identical, so if you’re looking specifically for a color dupe for Chihuahua, Stripped Down is an excellent option. Texture wise, though, there is a bit more of a difference. The Too Faced Melted Lipsticks have a creamy texture that dries down to a satiny-matte finish. They’re incredibly opaque and long wearing, yet comfortable. The Maybelline formula is also very pigmented, but has a glossier feel than the Too Faced. With the applicator being so small, the initial application can be a little patchy, but if you build up the product and finesse things a bit, you can get a nice, even application. The formula will last decently well, but is definitely not transfer proof nor staining. Be prepared to reapply after eating or drinking. Scent-wise the Too Faced Melted Liquid Lipsticks sport a sugary-sweet fruity scent that reminds me a lot of Sweet Tarts. Maybelline also went the fruity route with the Color Jolts, opting for a strong melon scent. The Too Faced scent has my heart, but the Color Jolt is still pleasant. Final verdict? I’m going to say, splurge. While I think Maybelline did a pretty good job of trying to dupe these TF liquid lipsticks, you’re paying the same amount per ounce for a formula that isn’t quite as good. 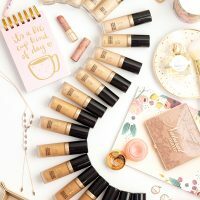 Too Faced also has a way larger color range, with 15 shades in the original finish, plus a whole range of Melted Metal and Melted Chocolate shades, whereas the Color Jolts are only available in 8 colors. So yes, while you can get two Color Jolts for the price of one Too Faced Melted Liquid Lipstick, I’d say you’re almost better off with one lipstick you absolutely love than two that are good but not knock-you-socks-off fantastic. This next pairing was one I stumbled upon most recently. I don’t do a ton of beauty shopping at Walmart, so Hard Candy is one of those brands I’ve yet to explore. However, during a recent trip to pick up random household bits, I decided to take a stroll down the makeup aisle. One of the things that immediately grabbed my attention were the Hard Candy Cheeky Tints. I love a good cheek stain during the summer, but they’re definitely harder to find at a budget friendly price point. I thought it might be fun to see how it compared to my beloved Becca Beach Tint, which has been one of my go-to staples for a fast, natural looking flush. I grabbed the shade Surfer Babe, a deep watermelon pink, even though I knew it wouldn’t be a color dupe for the Beach Tint in Guava. 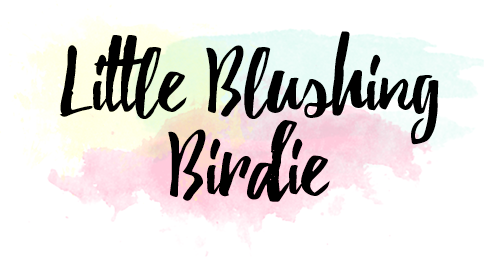 There are definitely some potential shade dupes between the two ranges, so I’ll share my thoughts on that at the end! I was pleasantly surprised to find that these two formulas are indeed quite similar. The Becca Beach Tint has a slightly more moussey texture than the Hard Candy Cheeky Tint and is perhaps a little more even in finish, but they both ultimately blend out easily into a nice, sheer stain. Once they dry down, they’re both incredibly budge proof and long wearing. The key to application with this kind of product is that a little goes a long way. I like to take a tiny dab on the back of my hand, work the product into a stippling brush, and then apply to my cheeks. This helps me get a more blended, natural looking finish. If there are still any harsh lines, I’ll go back in with my beauty blender or foundation brush just to soften up the edges. 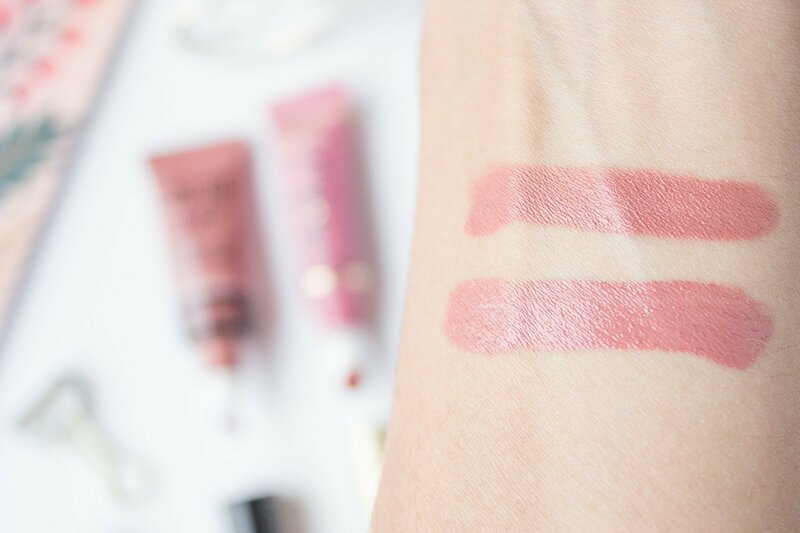 The only real major difference between these two cheek tints is the scent. 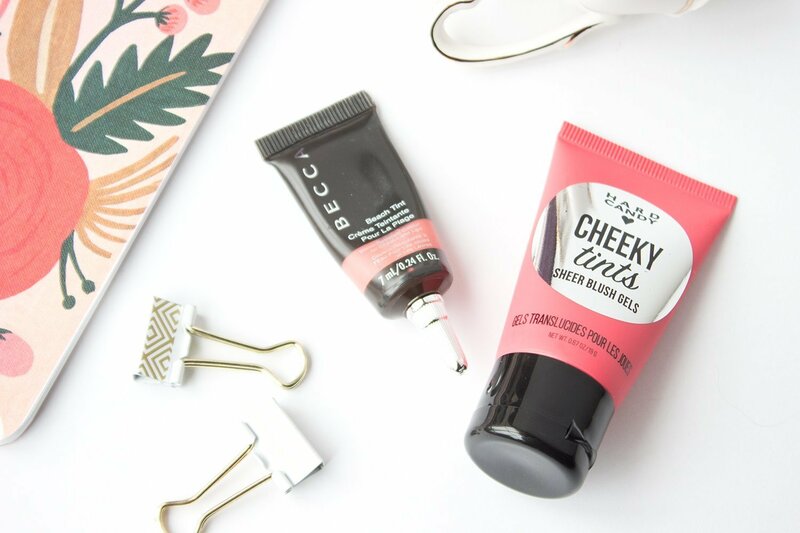 The Becca Beach Tints smell gloriously fruity, while the Hard Candy Cheeky Tints don’t boast any smell at all. As much as I love the scent of the Beach Tints, I know there are many people who prefer unscented products, so that might give Hard Candy the leg up for you. Another big win in the Hard Candy corner is for overall value. Each Cheeky Tint has 0.67 oz of product and retails for only $6, while the Becca Beach Tints only have 0.24 oz of product and retail for $25. 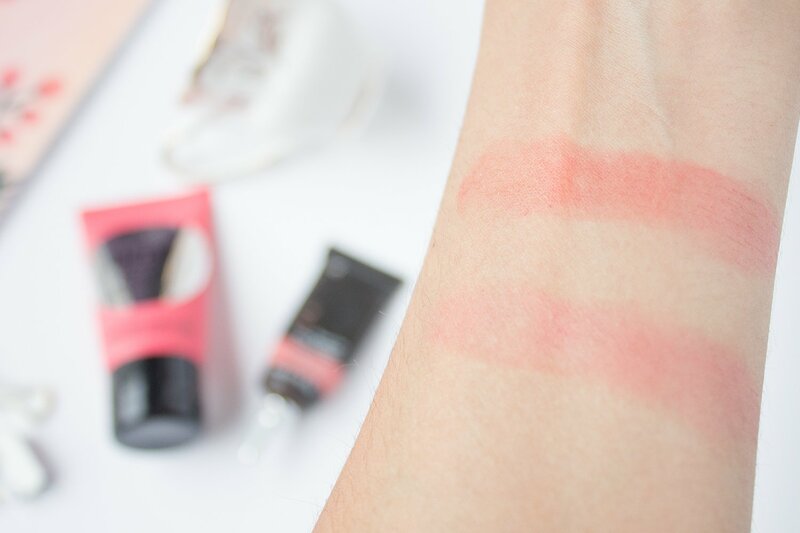 So, for more than double the amount of product at less than a quarter of the price, the Hard Candy Cheek Tints are definitely the better deal. You have a slightly larger range of colors to choose from with the Beach Tints (8 versus 6) but not impressively so. It looks like there are a few potential dupes out there (I’m thinking Hard Candy Diva and Becca Raspberry will be very similar, as well as You’re a Doll and Lychee) but having not swatched them all side by side it’s just a guess! Final verdict? Save. Don’t get me wrong, I still think the Becca Beach Tints are awesome, but I know that I don’t reach for them every single day, and $25 is a lot to spend on a “seasonal” product. If there’s a $6 option out there that is pretty comparable in performance, I’d say that’s your best bet! So I’m not gonna lie, my eyebrow game is not the strongest. I have mad respect for those girls who can perfectly sculpt and fill in their brows to the ultimate fleek status and am dying to understand what magical powers they possess. However, one of the products that has helped me to feel a little less failtastic has been the Anastasia Beverly Hills Brow Wiz. 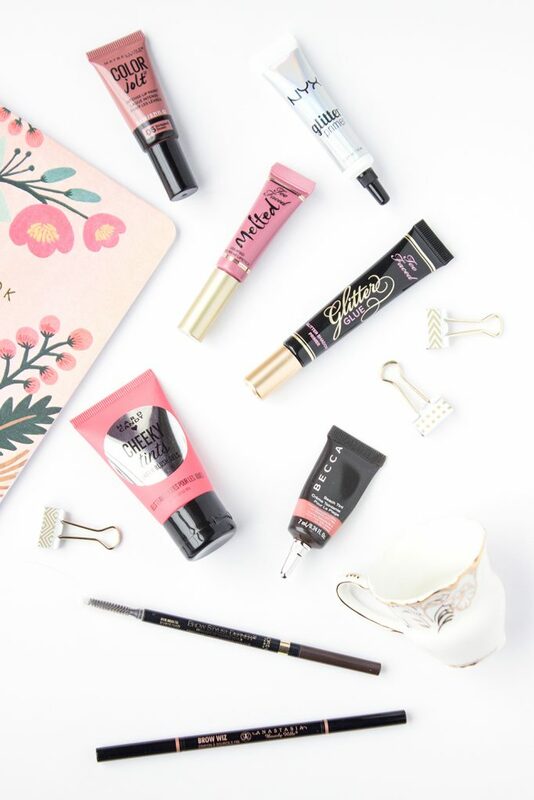 It’s got a micro fine tip that gives you amazing precision, and has just the right amount of pigmentation to allow you to fill in your brows while still maintaining a natural appearance. So many beauty lovers rave about this pencil, and after using it for about a year now myself, I understand where all the hype is coming from. The only downside? It costs $21. Honestly, $20 is not the worst price to pay for beautiful brows, but it’s definitely nice to have a more affordable alternative at hand. 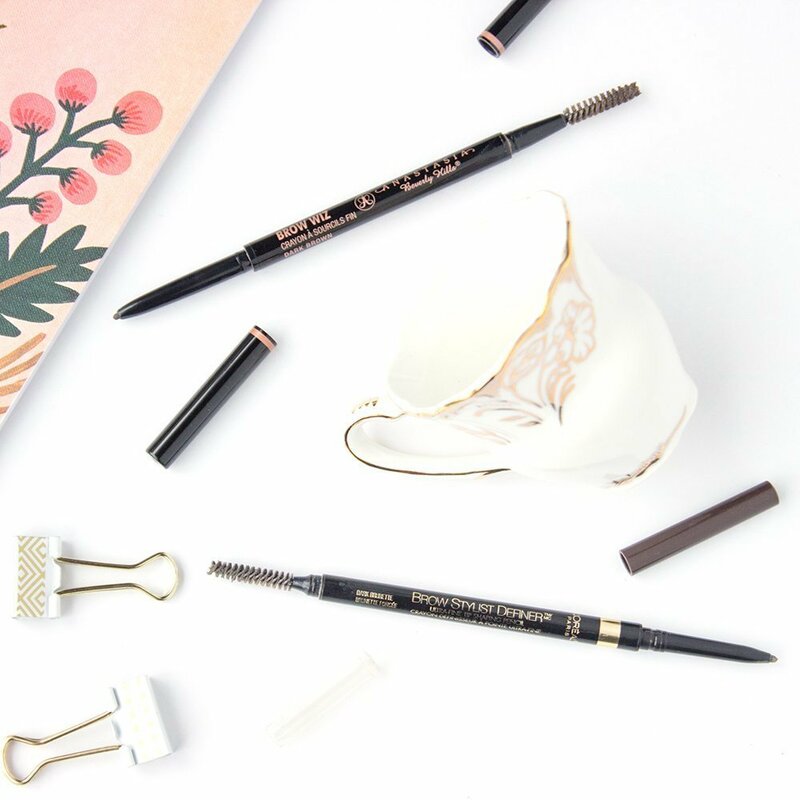 When L’Oreal launched the Brow Stylist Definer I thought my prayers had been answered. It was initially pretty difficult to track down (although it should be much easier now that the initial craze has quieted), but so very worth the hunt. As you can see from the design, there’s a lot these two pencils have in common. They’re pretty much identical in size, and both sport the same super fine self-sharpening tip. The also both have a spooly, which, on a side note, I have decided is a make or break it factor for me with brow pencils. A spooly allows you to groom your brow hairs into place and to help distribute product more evenly. To me, a brow pencil without a spooly is just…wrong. There. I said it. You spooly-less pencils are just not up to snuff. Texture-wise the actual pencil formulas are slightly different. I think that the Anastasia formula is ever so slightly creamier, although both of them have pretty much perfect color payoff. You can create a very natural looking stroke with both pencils without using a lot of pressure, but neither is so overly creamy or pigmented that you have to be painstakingly careful when using them. They also both hold up very well over time, so you can get through that 10 hour work day without having to worry about touching things up. The biggest difference for me between the two pencils I own are the shades themselves. I have the Brow Wiz in the shade Dark Brown, and the Brow Stylist Definer in the shade Dark Brunette. In the picture above, the left eye (my right) has the Anastasia pencil, and the right (my left) has the L’Oreal. Dark Brown is notably warmer in undertone than Dark Brunette is, although either one looks relatively natural against my hair color. Truthfully, the biggest limiting factor about the L’Oreal Brow Styist Definer for me is the color selection. There are only three shades to choose from (blonde, brunette, and dark brunette) versus the Brow Wiz, which has 10 shades. In the end, this was a tough one for me. I’m going to say, if one of the three Brow Stylist Definer shades suits you well, I’d definitely save your money and go that route. The $8.99 price tag is less than half of Anastasia’s, but the quality is totally on the same level. However, if your natural hair color is extremely light, or has a very specific undertone, you’ll probably have way more luck finding a match from Anastasia. If you guys missed my review of the Too Faced Glitter Glue, it was one of those blow-your-mind-what-have-been-doing-with-my-life kind of products. I never thought I needed a glitter primer in my life, but boy was I wrong. 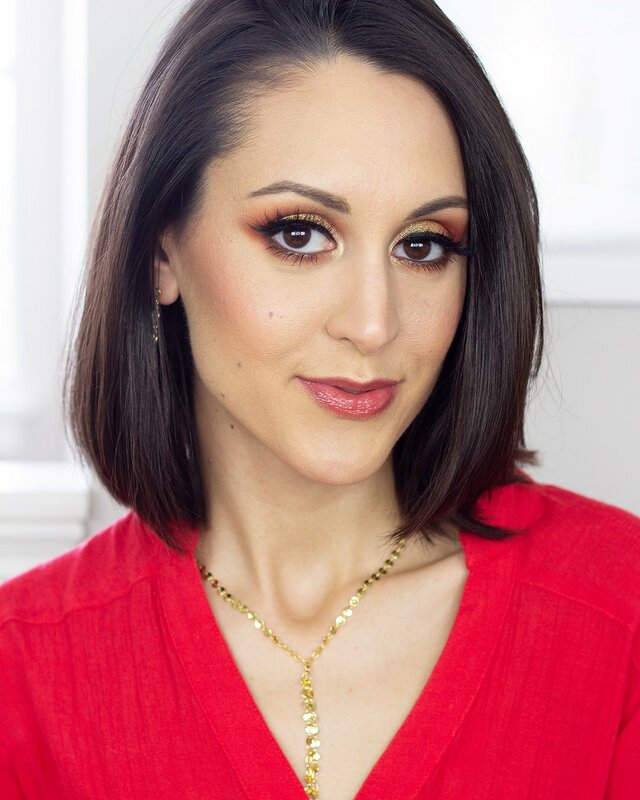 They’re a definite necessity if you want to use a loose glitter, but what I didn’t realize was how amazing they are at amplifying the intensity of glittery and metallic eyeshadows. 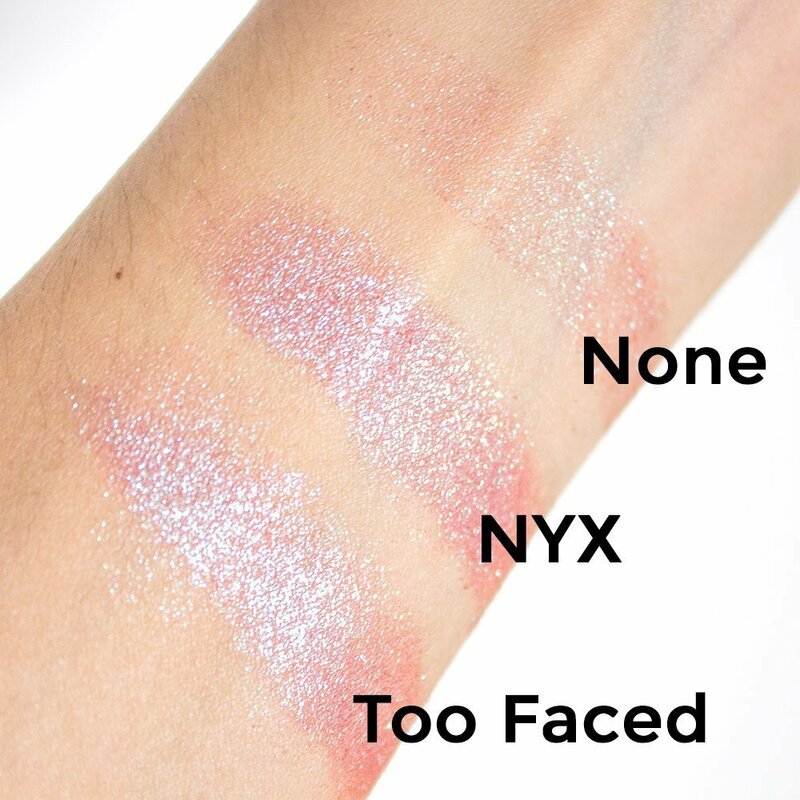 Shortly after I fell in love with this product I noticed that NYX had released their own Glitter Primer and wondered if I had just wasted $20 on the high-end version, or if there would be a notable difference between the two. What I’ve noticed is that there are a few subtle differences between these two primers, but when it comes to the bottom line, they’re basically both effective at doing the same thing. They’re both translucent, creamy primers, and they both do a great job of amplifying glitter and locking it into place. However, the texture of the Too Faced Glitter Glue is a lot smoother and more even. 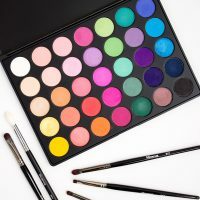 As a result it blends out very easily, allowing you to just tap on a little primer on top of your existing eyeshadow without needing to fuss. The NYX Glitter Primer, on the other hand, has an almost plastic-y feel to it and takes a lot more work to blend out. Once you’ve got an even coat on your lids you’re good, it just takes more time to get there. I decided to do a side-by-side comparison swatch using the oh-so-beautiful Urban Decay Moondust Shadow in Solstice. I wish the camera did this shade justice, but it just doesn’t capture the insanity of the red-blue duochrome shift. Still, you can definitely tell that compared to a naked arm swatch, this eyeshadow totally shines when you put a glitter primer underneath it. I sort of failed a little with my swatching game, but next to each other the TF and NYX primers give a very similar finish. I think the NYX is maybe a little more bold, but the TF was a little smoother. Even though these two tubes look slightly different size-wise, it’s all the magic of packaging. For $6 NYX gives you 0.33 oz of product while Too Faced gives you 0.35oz for $20. Of course Too Faced always does a beautiful job with the design of their products, but I have to admit that the holographic packaging on the NYX primer is pretty cool too. In the end, as much as it pains me, I’m going to recommend you save your money. Again, even though I think the Too Faced Formula is a little better quality-wise than the NYX, I also know that glitter primers are not something most of us use on an everyday basis. 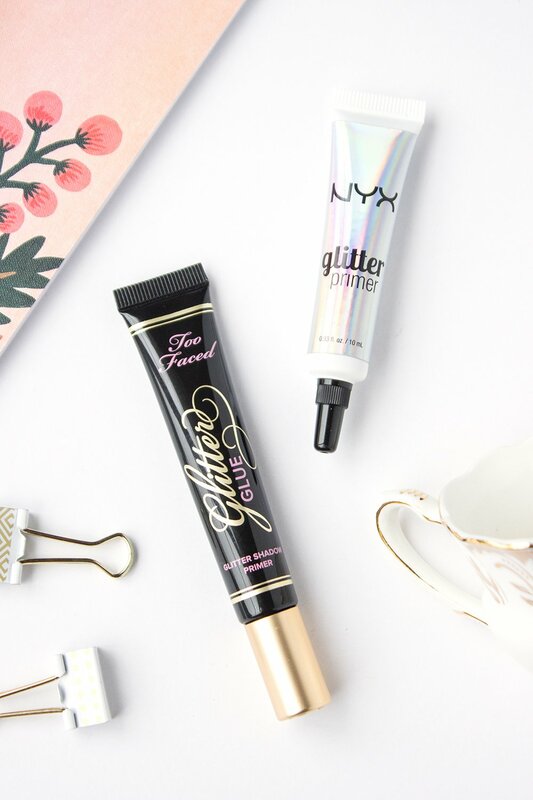 If you’re only going to reach for your glitter primer once a month, it’s probably not worth it for you to invest $20 in the Glitter Glue since the NYX Glitter Primer will get the same job done for so much less money. 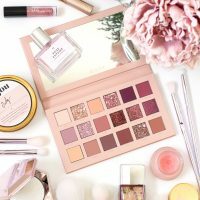 If you’re a MUA and would be utilizing this kind of product in your kit then maybe it’d totally be worth it to go the Too Faced route. Either way, if you don’t own a glitter primer and you ever wear eyeshadow with a bit of sparkle, do yourself a favor and pick one of these two up! The difference it makes will knock your socks off. I hope you guys found these little side-by-side comparisons helpful! If you have any other recommendations for product dupes I should try next, definitely post them in the comments down below. In the end I want to be able to help you guys spend your money wisely, which for me doesn’t lie on either extreme. Sometimes drugstore products are bomb, sometimes there’s just no comparison to the quality of a high end product. The important thing is knowing which is which before you swipe your credit card. 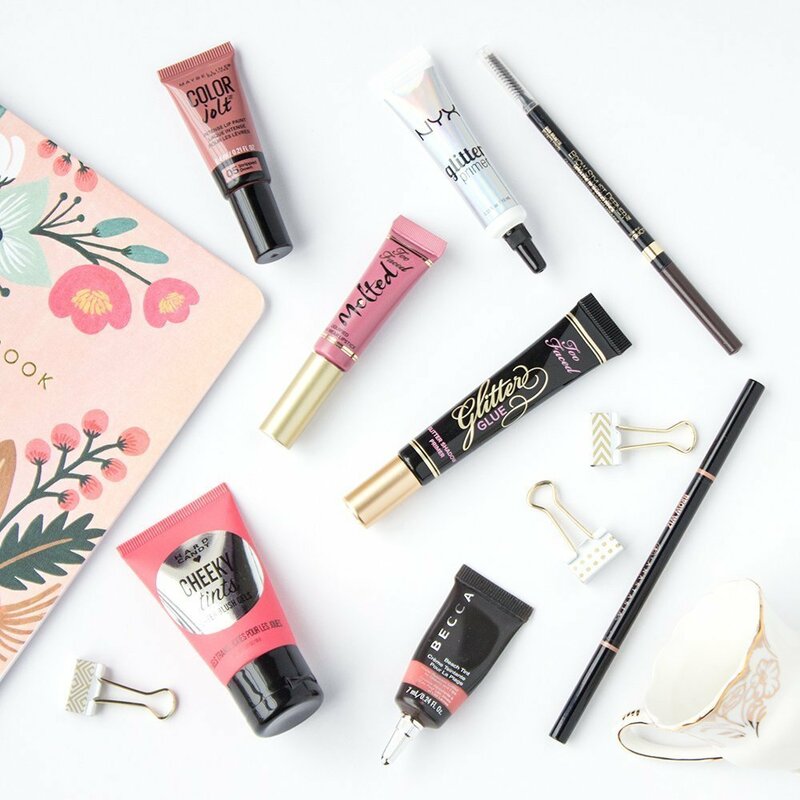 Which of these products would you splurge on?